← Welcome bird nerds and behavior addicts! Four of the finest teachers in my life are my flock of cockatoos. I can honestly say that not a day goes by that they do not challenge me, make me laugh, infuriate me, or teach me more about myself. Their personalities and histories are as different as can be, and each comes with his or her unique strengths and tests. To be sure, from the beginning we have encountered some unexpected obstacles on a personal level, leading to a host of changes, new environments, new friends, and new routines. Though at times it would have been easier to find temporary living situations for them when life got extremely rocky, I can’t imagine navigating those times without them and drew tremendous strength from our family unit. Henry is a sulfur-crested cockatoo, Cacatua galerita triton hatched in 2001. I have had him from his earliest days, but unfortunately his feathers were mistakenly clipped at a veterinary appointment shortly after his first flight. Though he regained his full wings on his next molt, the damage as done, and he missed a very impressionable period at which he would have learned to fly. While he is a competent flier now, he still prefers to walk – or rather, amble – as his first mode of transit in the house. I’ll say right away, Henry is nearly perfect. He will go to anyone, has never bitten a soul, and is content to ride around on one’s shoulder for the entire day. In fact, you have to remember to let him off to relieve himself because he won’t defecate on your shoulder! He loves attention and will turn it up a notch the more ooo’s and ah’s he hears. He also has a funny thing about stepladders, plastic home depot buckets, and dustpans and will not leave any of the above alone when placed in sight. Ever the comedian, Henry always injects humor into our lives on a regular basis. When playing outside, he’ll walk backwards to keep the wind from ruffling his feathers the wrong way. 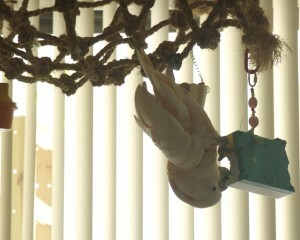 When I lived in Wyoming, he was playing in the yard and suddenly stood still and dangled one of his feet in the air. I rushed over in a panic, only to realize he had stepped in antelope poo and appeared thoroughly disgusted about the debris on his toes. 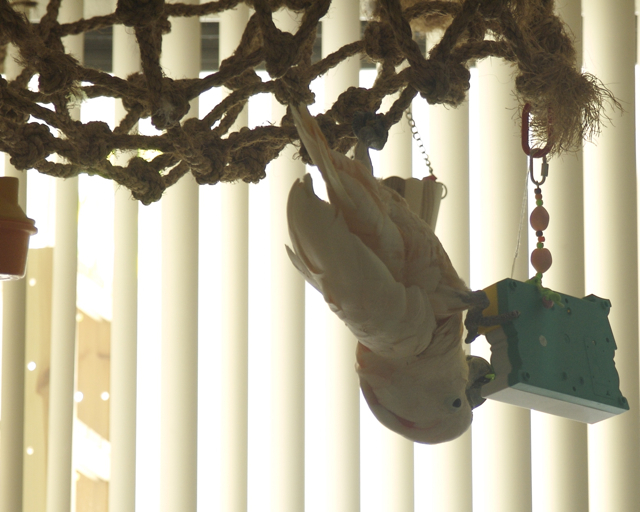 Sailor is my slender-billed cockatoo, or eastern corella. She has graced the cover of Good Bird magazine on a few different occasions, where her personality comes through the pages, it seems. A flirt to the point of annoying at times, she loves landing on new people and snuggling in to the crook of one’s neck, clucking naughty nothings and flaring her tail. Sailor likes to hop like a little bunny, play on her back, or be picked up like a football and gently mauled and raspberried. An extremely fast flier, Sailor has long, pointy wings and can zip, dive, juke, and roll upside down. She is vocalizes quite a bit in the air, and calls back and forth to Juice and me frequently or gives a battle cry as she plummets in a nosedive from the sky. 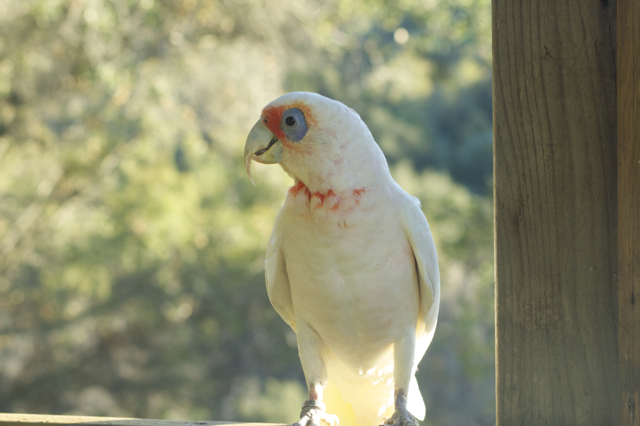 Sighhhh… and then there is Juice, my bare-eyed cockatoo. There is nothing atypical about this little corella, she fits every bare-eyed stereotype there is. Whip smart and lightening fast, she can learn new behaviors and tricks in under two minutes. She is always on the lookout for a meal to steal, and has tried to fly off with an entire peanut butter and jelly sandwich in her beak. Though she is a little bit more shy and standoffish, she and Sailor are two peas and a pod and are never separated. This does not mean there is always harmony, and their bickering reminds me of childhood arguments with my own sister. There is one in every family, right? Well, Sam is my challenging one. A ten-year old male moluccan, he came to me at five years of age after a few tries in other homes. I am extraordinarily lucky to have found such a well-raised fellow that has never had his wings clipped. For the first several years together, he was a dream to live with. We even lived in apartments with shared walls for the first two years of our time in San Diego. However, the day we moved in with my partner, Andre, trouble began as both Henry and Sam developed a very intense “crush” on Andre and vied for his attention. Suddenly, Sam started building nests, lunging, biting screaming for Andre, and fly-attacking everybirdy, even Andre and me if he got over-excited. When Andre isn’t around, Sam is his usual wonderful self. But when Andre is home, we see a full range of very intense behaviors. 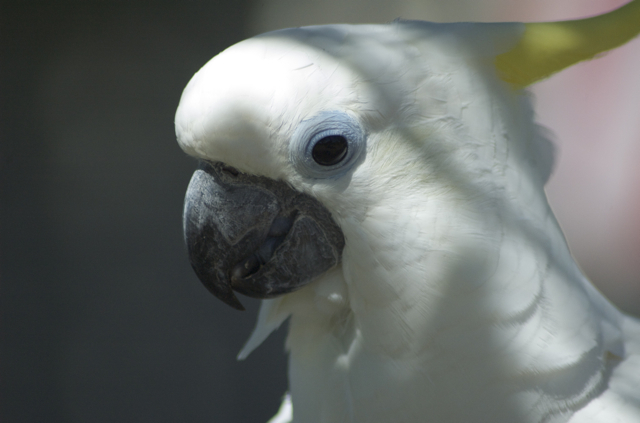 One of the challenges parrot keepers face is not only helping others with parrots, but also helping those we live with to maintain consistency in our animals’ lives. Our story is no different, and my experiences handling this complicated situation has taught me so much about myself and helped me become a better teacher and trainer. I hope in this blog I can detail how I continue to work through some of these difficult behaviors and replace them with more appropriate behaviors. As anyone who lives with parrots knows, there is so much more to my birds then what can be summed up in a few short paragraphs. 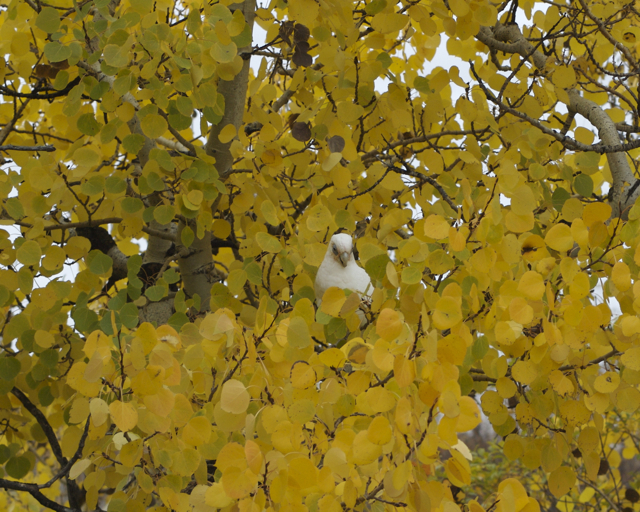 Nevertheless, hopefully it’s a starting place to familiarize you with the true teachers and writers of this blog: the parrots. They are each extraordinary in the volume they have taught me about behavior, as are all parrots. Though at times I envy the “normal” life without cage cleaning and enrichment preparation, I can’t imagine how dull my days would be without them. This entry was posted in General News and tagged Henry, Juice, Sailor, Sam. Bookmark the permalink.